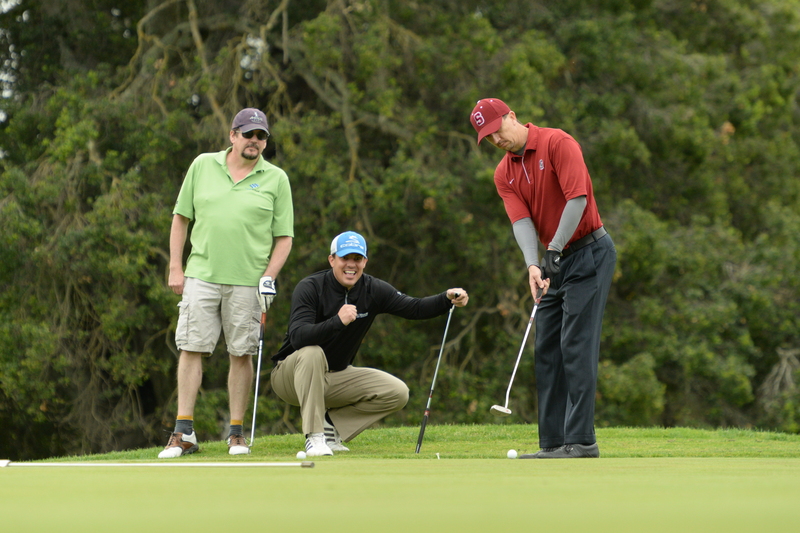 The 2016 Harker Golf Classic united Harker alumni, parents, alumni parents and their friends at the renowned Stanford Golf Course to raise funds for Harker’s General Endowment. For the second year in a row, the event was presented by the Harker Alumni Association. The April 11 event brought 96 golfers out on a pleasant spring day. Jeremy Pomer ’91 was the event chair, while former Harker faculty member Howard Saltzman and current lower school math teacher Pat Walsh served as honorary marshals for the day. The marshals had a great time handing out prize ribbons and libations to golfers. “Everyone had a wonderful time, made all the more meaningful with the knowledge that it was good fun for a good cause!” enthused Karri Baker ’84, director of alumni relations. A variety of special awards and prizes, as well as numerous generous sponsors, helped make the day special. Capping off the event was a 19th hole reception with live music on the clubhouse patio for golfers, as well as non-golfers, wishing to join in on the fun. A highlight of the day was the announcement of the winning foursomes. The winning men’s foursome comprised Harker parent Mike Armstrong, Trask Leonard, Josh Breeding and Rodney Plett ’81. The winning women’s foursome comprised Thu Ka, Connie Kim, Kavita Patel and Kavita Tankha, all Harker parents. The Stanford Golf Course, designed in 1930 by renowned golf course architects William Bell and George C. Thomas, is located in the foothills above the Stanford University campus. In 2009, it was rated the nation’s third-best college course by golf coaches.